Whether you’re looking for an entry level or executive level IP phone, stay connected to your calls with a FortiFone IP phone. Each FortiFone is a feature-rich experience with high quality audio and dedicated keys for the most common features. The FortiFone experience offers a range of options from phones that can be used in a hotel or waiting room, to phones that offer vivid color screens, with programmable line and extension appearances. Managing calls has never been easier. Stay connected with a complete office phone solution. Combined with the powerful features of the FortiVoice PBX, the FortiFone delivers more than just what you need, it gives you what you want. 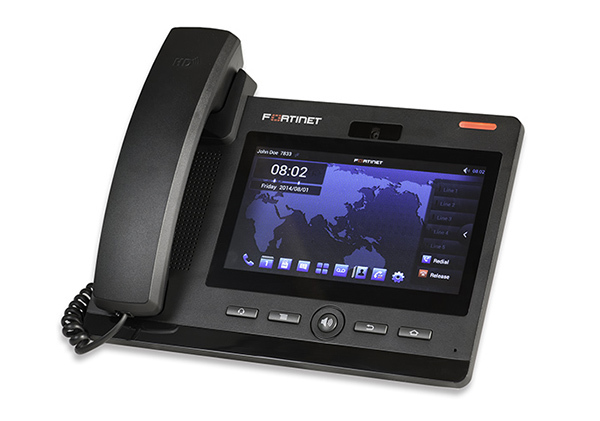 The new FON-H25 is a customizable IP phone with high quality audio and dedicated feature keys. With 6 programmable keys along the top, one-touch access for important calls can easily be configured, making this phone feel right at home in a hotel room, waiting room or right in the office. The FON-H35 is a customizable IP phone with high quality audio and dedicated feature keys for hotel use. With 6 programmable keys along the screen, one-touch access for important calls can easily be configured. The FON-H35 also offers the ability to customize the screen, so you can easily add instructions and hotel information for occupants. Introducing the FON-175, a no fuss IP telephone that puts the features you need at your fingertips. The HD quality audio, 11 feature keys, color screen and ease of use, make this a phone that works in any office. The FON-375 features a whole lot in one great package. Not only does the phone deliver crystal clear audio, the easy-to-read and easy-to-use second screen can be programmed to show you who is on a call, which lines are in use and more. With a vivid color display, premium audio quality in both the handset and speaker, the FON-475 is a great phone for any office. The dedicated feature keys and programmable appearance keys give you the power to easily control your calls. All of these features and more give the FON-475 a lot of bang for your buck. With a large, vivid color touchscreen, premium audio quality in both the handset and speaker, the FON-570 is a great phone for any office. Combine the touchscreen with dedicated feature keys and 29 programmable appearance keys and the power to easily control your calls is at your fingertips. All of these features and more give the FON-570 a lot of bang for your buck. Introducing the FON-670i/675i, a great combination of businessclass features and vivid touchscreen. An executive phone with programmable appearance keys and the features you need at your fingertips. With an optional HD video camera and HDMI out port to compliment these features, this new FortiFone is a power house. The FON-C71 conference phone offers you a premium HD audio experience. With full-duplex technology and acoustic echo cancelling on the three microphone array, you get clear and concise audio. Add on the ability to connect your mobile phone via Bluetooth for a Unified Communication experience. Download the Fortinet FortiFone IP Series Data Sheet (PDF).